I dug the 6 holes, each one a fair amount bigger than the concrete block that would fill it. I want to build a pole barn to house my boat collection. I like to keep them all out of the sun and covered, but our Com-Pac Sun Cat had no shelter while awaiting the pole barn. 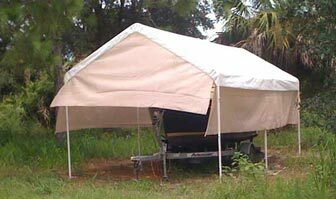 Since it will probably be a long wait, I wanted an inexpensive and semi-permanent sun shade for the boat. I found a nice instant garage but was put off by the price of $599. Just a bit more than I had in mind spending for this project. I kept looking and found an inexpensive canopy shelter that looked like it will do the job for $129. For another hundred bucks you can get a set of enclosure side curtains, but I did not get those. 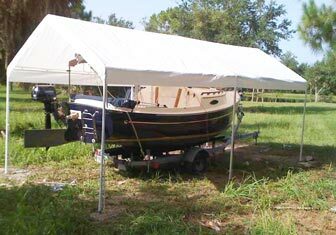 I may hang mesh shade cloth around the sides and ends to help protect the boat a bit without cutting off air flow. The shade canopy comes in a pretty heavy box containing the steel frame parts and the poly tarp cover. I was able to do the initial assembly of the top frame with no trouble. I wanted to put it together to verify that the leg dimensions would be as advertised, and they were. Next I needed some way to tie it to the ground. I plan remove the cover from the frame in the event of really severe weather approaching, but I'm not always home when a fierce thunderstorm comes up, so I had to tie this frame to the ground well. 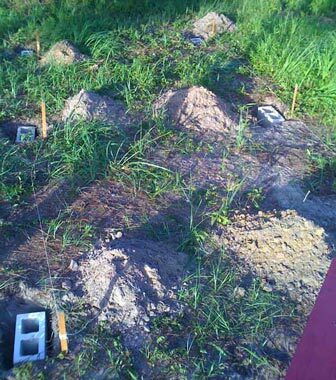 The first step was to put six stakes in the ground to form two 10' by 10' squares side by side. I just took a wild guess and then started measuring diagonals until I had the stakes square with one another. I then took my best shot at running a level string all the way around the perimeter. I only had a rather junky 2' level, but managed to get it pretty close. 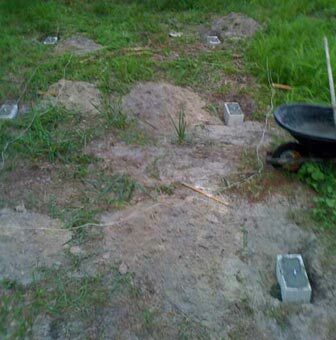 Next I dug the 6 holes, each one a fair amount bigger than the concrete block that would fill it. I wanted each block to have a tie down embedded in the concrete, so I bought 6 eye bolts with nuts and flat washers. My idea was to put the blocks in the holes, get them square and level with respect to each other, and make sure each one was resting on its ends, with a few inches of space underneath. 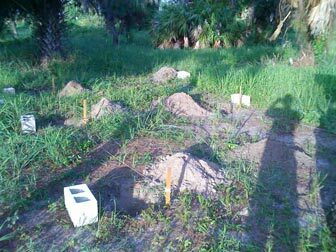 I figured that when I poured each block full of concrete, some would spill out the bottom of each block, making kind of a mushroom shaped anchor in the ground. It took a while to get the blocks positioned the way I wanted them. I wanted each block to have a tie down embedded in the concrete, so I bought 6 eye bolts with nuts and flat washers. I put the nuts and washers down near the bottom of each bolt and put them in the blocks when I poured in the concrete. Each block took about half of an 80 lb bag of concrete mix. The next day, I filled the holes and put up the frame and fitted on the polytarp canopy. The next day, I filled the holes and put up the frame and fitted on the polytarp canopy. I was not happy with the tie down ropes they provided, and used some of my own. I also wired each frame joint to the eye bolt below with heavy bailing wire, so that a strong gust could not stretch the rope enough to disassemble the frame. The tarp cover attaches to the frame with two drawstrings, one on each end, along with a row of bungee loops along each side. I expect this tarp to last a year or so before those parts begin to give out, but I figured they're good enough for now. I finished up in the last light of the evening. The next day, I got the boat under the shade. Woo hoo! Watching the boat bake in the heat of the day was killing me, and I'm glad it is sheltered. I bought a roll of mesh shade cloth and made side curtains for the boat shelter. I just wrapped the shade cloth around the frame pieces a couple of times and then attached with tie wraps. I found that the canopy provides good shade in the middle of the day, but in the mornings and afternoons, the sun was coming in under the edges of the cover and hitting the hull. The boat has a blue hull, which is prone to fading in the sun. I decided to buff and wax it, but also wanted to protect it from further damage. I bought a roll of mesh shade cloth and made side curtains for the boat shelter. I just wrapped the shade cloth around the frame pieces a couple of times and then attached with tie wraps. The mesh shade cloth is breathable and I did not attach the bottom edges to anything. I figure that leaving them to flap in the breeze will reduce windage on the structure, making it less likely to blow away in a storm. I took an old piece of Starboard that had been laying around in the back of my truck for a couple of years and cut out some storage hatch boards for our Sun Cat. They aren't pretty, but they're impervious to the weather and they were free! In addition to protecting it from the sun, I don't have to worry as much about what bad things might be happening to the boat when it's raining. 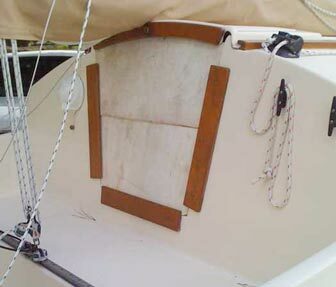 One of the bad things that happens to a Sun Cat in the rain is that the hatch boards get soaked, and being made of plywood, they can deteriorate quickly if not protected properly. I have coated the edges of mine with epoxy, but the real proper protection is to leave them indoors when not in use. Other than worrying about what a passing thunderstorm might do to my little tie down system, I'm very happy with this solution. It has already weathered a few storms in the past month or so since I put it up, with no problems at all. I just hope it lasts until I can build a proper pole barn!